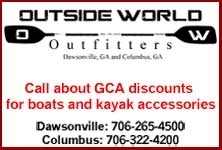 Come paddle the Tuckaseegee River on Saturday September 22, 2018 – the Saturday of the Fall Gala. Plan on meeting at the old put in under the bridge at 10:30 am. We will drop off boats, gear and extra people then head to Smoky Mountain River Adventures for shuttle. Please bring $5 cash to pay for your shuttle (drivers only). Can someone please provide more clear direction to the meeting location? The “old put-in under the bridge” is not going to get someone there who hasn’t used that location before. Thanks. Karla Vinnacombe will be with me.